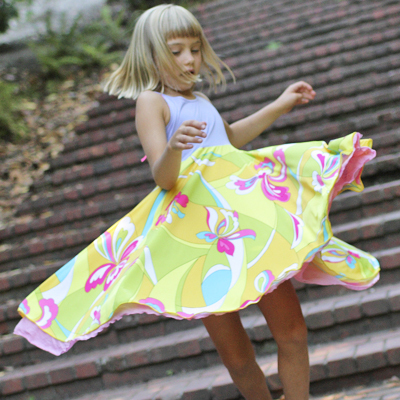 Designer Cynthia Jamin hand sewed the first Original Reversible Twirly Dress® back in 2006. The minute her own daughters started wearing them, a craze was born. This unique dress features 2 full circle skirts, soft stretchy colorful fabrics, and offers lots of growing room. Because it’s reversible, it's really 2 dresses in one. Each side has a completely different look and personality so she can flip it for a new mood. Twirling in a pretty dress makes a girl feel beautiful inside and out, and our creative styles inspire them to be confident in expressing themselves. Once she tries it on, you’ll see why it takes a twirl to raise a girl. NOTE: This unique design has been granted a Trade Dress by the United States Patent and Trademark Office. Registration Number 5009824. This is very rare for designers to obtain, we are honored.